We specifically got a tour of the local collection, which means art of Cuba’s since the Revolution. Our guide gave in-depth discussions of a number of artists and how their work reflected both their time and their unique take on how other artists portrayed similar events in their own lives. 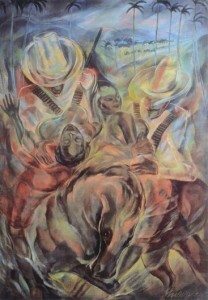 Close examination of Enriquez’s painting shows that the woman have the power. rather than the men in the original painting(s). We saw works by Victor Patricio, Amelia Pelaez, Wilfredo Lam, and others.